The USS Decatur underway in rough seas. Navy photoThe San Diego-based destroyer USS Decatur had an “unsafe” interaction with a Chinese warship Sunday while conducting a freedom-of-navigation mission near disputed islands. 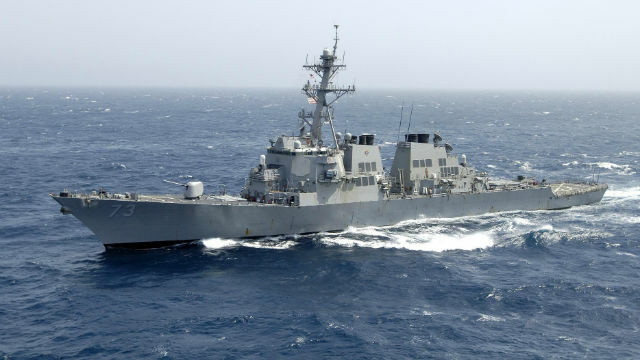 National media quoted Navy spokesmen as saying on Monday that the Decatur had to take evasive action when a Chinese destroyer came within 45 yards. The incident occurred near Gaven Reef in the Spratly Islands in the South China Sea. The group consists of more than 100 small islands and reefs off the coasts of the Philippines, Malaysia and southern Vietnam. The islands are close to major shipping lanes. China has enlarged and fortified a number of small islands in the group, sparking protests by Brunei, Malaysia, the Philippines, Taiwan and Vietnam, which also have claims. In May the destroyer USS Higgins and cruiser USS Antietam sailed near four disputed islands in the Parcel Islands group.